Camping in a campground is fine, but there are many who want to get even closer to nature. They enjoy wild camping, which is pretty much what it says on the tin, camping away from civilisation, and without the modern conveniences of the camp site. It’s not for wimps, since this is real 'roughing it', but those who have the taste absolutely love it. The thing to remember, though, is that all the land in the United Kingdom is owned by someone, meaning that there are laws that apply to wild camping, those that apply in England and Wales, and different ones in force in Scotland. For the most part there’s little problem with wild camping in England and Wales, although if you’re going to be relatively close to a farm, you should make sure you’re above the intake walls, and it’s probably best not to advertise your presence. In theory the farmer could tell you to move from his land, but as long as you’re being careful and responsible, there should be no problem. Generally wild camping is quite acceptable if you’re more than half a day’s hike from a campground, although, within the UK, that’s generally unlikely. Within the National Parks, wild camping is a right. However, there are certain limitations. It has to be on access land (and not all land in a National Park is access land), more than 100 metres from a road, and you must use a tent, not a caravan – for pretty obvious reasons. But in Dartmoor the right allowing wild camping is enshrined in an amendment to the Countryside Act of 1949. There will also be exceptions at times. In the Peak District, for example, wild camping has often been banned when the moors are dry to avoid the danger of fires which can be difficult to put out and can easily destroy acres of land. When wild camping, you do need to observe good camping etiquette, by leaving the land just as you found it, taking all litter with you, making sure there’s only a small group of you, and ensuring that your toilet is more than 30 metres from any water, taking care to carefully bury your toilet waste – so be sure you have a small digging implement with you. You should never spend more than two nights in the same camp, whether on private or National Park land. New laws about wild camping in Scotland came into effect in 2005, and set out exactly where it’s permissible to camp. What it largely boils down is that wild camping is fine except in building sites, schools (and their grounds), around houses, in areas where admission is charged, quarries, golf courses, sports fields (but only when they’re in use), and around buildings. You also need to be more than 100 metres from a road (there are exceptions here with sites close to lochs, for instance, that have traditionally been used for camping but might be close to roads). Where no access rights exist, wild camping is not permitted without specific permission, so you need to be very aware of where you are and what kind of land it is before trying to set up camp. You should not exceed two, or at most three, nights in any one spot. Always make sure you take everything with you when you leave a wild camping spot. It should look as if no one had ever been there – still wild, in other words. If you don’t do that, you’re really desecrating the place (and it’s surprising how many never fully clean up after themselves, shame on them). Wild camping isn't for everyone. It can sound appealing in the middle of summer, when the weather is warm and there's no chance of rain. 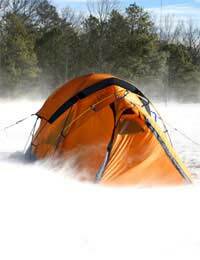 But as soon as the weather turns, don't try it unless you're pretty tough and you have plenty of camping experience, as there's no one around to help you. Make sure people know where you're going in case of any problems, and carry a mobile phone.